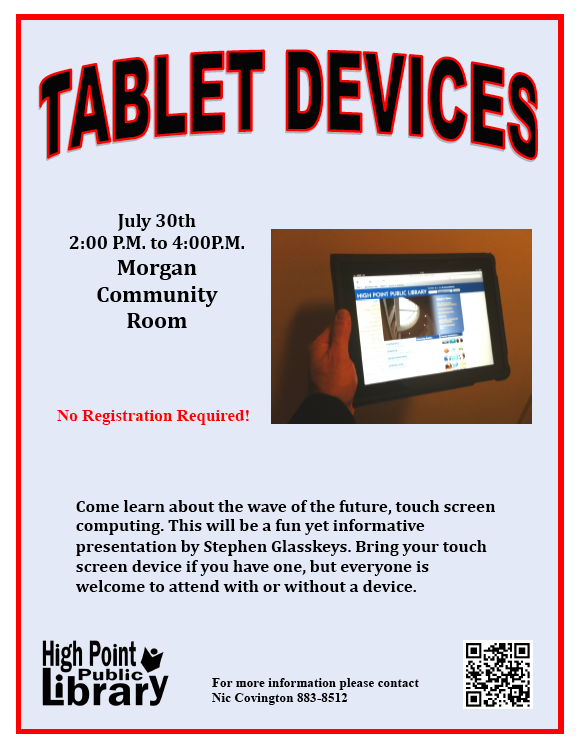 Cheers to Nic Covington for his great work on this flyer for the Tablet Devices presentation I will be giving later this month on July 30th from 2-4 PM at the High Point Public Library, North Carolina USA. Thanks again for your hard work, advice, and dedication to this project Nic! For further information, contact Nic at (+1) 336-883-8512. Flyer available for direct download here. « How to add the app Launcher to the Android Home screen and toolbar. Thank you so much for the presentation at the High Point Library yesterday. I learned an enormous amount and came away wanting to know more. Your professionalism and passion for your topic was evident. Now that I am aware of your website I will make intensive use of it. If you plan a more advanced workshop I would like to attend. Thank you for the kind comments. I do have more advanced topics in mind for presentation, however you can also join the Triad iPad and tablet computer user group to meet in a more informal setting and bring up a topic or question.